An oasis of greens in the middle of The Old Pueblo. There was something in a salad that had me perk up and quiz, "The heck did I just eat?" Among the mix of berries, vegetables and a relatively decent vinaigrette was this intense, near wasabi-like heat from one of the greens. Hunting through the overly large bowl, I found the culprit: A yellowish tinted leaf that, when eaten alone, puts the pepper blow of arugula to tearful shame. When I inquired, our server told me that it was a mustard green provided by a small local farm. Before I left, I got a tip-off and decided to contact the folks that could grow such a palate blast from soil and seed. On South Tucson Boulevard, in an abandoned special needs school, resides Merchant's Garden. Outside of a large greenhouse on what could have been a playground at one time, there is no indication that a farm actually exists. At first I thought I was lost but when a modular classroom door opened, a slender man in a distressed ball cap waved and welcomed me in. 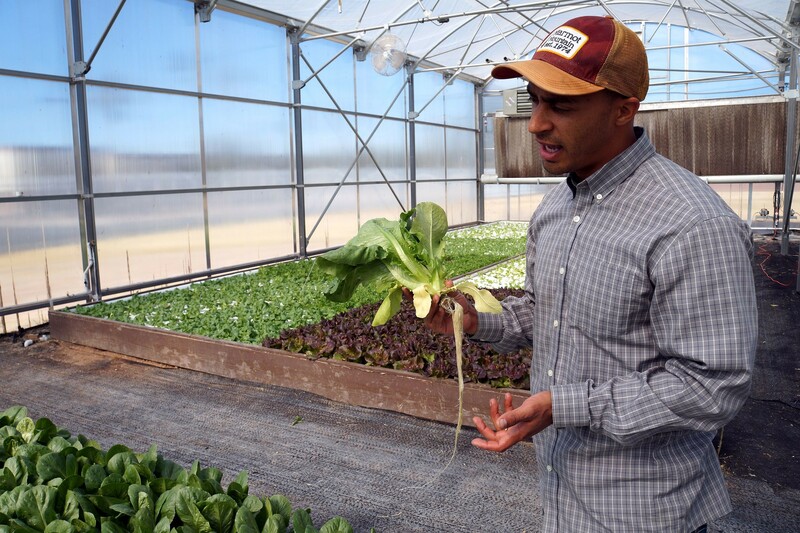 Chaz Shelton is the founder and CEO of Merchant's Garden, who started the company with his father in 2015. "Honestly, before this, I had zero agriculture experience," says Shelton with a bright smile. "I was in health care and I just saw a big need for healthy food. So together we got this property and built a greenhouse. Then it started to take off from there." Originally from Michigan, Chaz was in business school when the idea for Merchant's Garden formed and investors began to come aboard. Before long, they began harvesting up to 1,000 heads of produce a day, including both red and green leaf bok choy, Thai and Genovese basil, butter lettuce, romaine, green and red leaf lettuce and, of course, the reason for my visit, mustard greens. The flavor from the herbs and greens they grow is extremely dense. You've had romaine before, but not quite like this. Using a unique hydroponic system, Merchant's Garden yield is incredibly rich in color, taste and most importantly nutrients, due to a clever way of fertilization. Just shy of the main grow arena, several tanks are filled with swimming and splashing tilapia whose waste water is funneled into a UV chamber before getting triple filtered. Then it irrigates the various strains of seedlings. This is an ingenious and unique way to fertilize their crops and, with help from the Monterey Bay Aquarium in central California, they have created a new level of sustainability while at the same time adding on their already growing roster of fresh food for Tucson restaurants and residents. "When the fish hit a pound and a half, we can sell them," says Shelton. 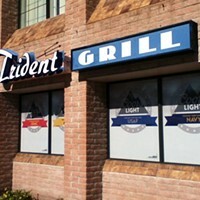 "We had no idea the demand for fresh fish here in the desert. We even donated some to the zoo. The bears were terrified of them at first because they have never seen or eaten a fish that big and fresh. Then they loved it. Even the lions ate up the fish. Who knew?" 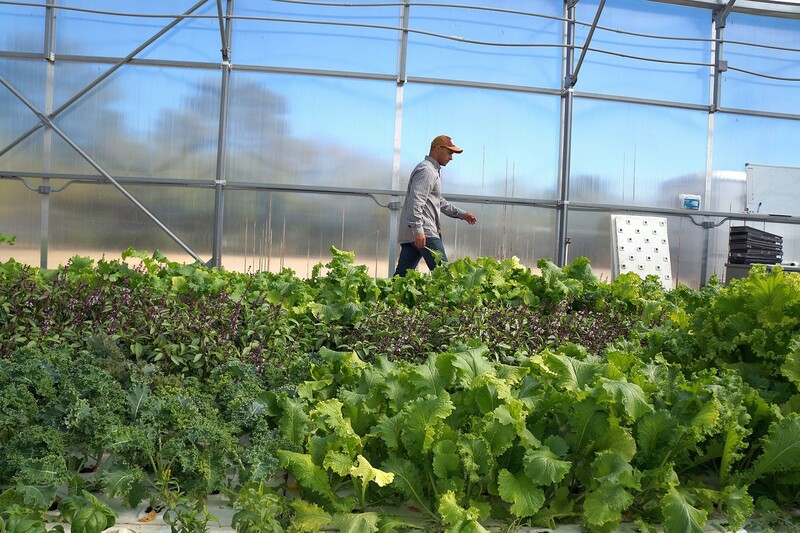 Because of the sumptuous produce and the freshest tilapia in southern Arizona, it did not take long for local chefs to dive in and begin utilizing Merchant's Garden in their seasonal and regular menus. So that inventive salad you just had at Urban Fresh, the fragrant basil composed in a dish at Senae Thai Bistro or a sandwich topping at Diablo Burger, most likely came from the Merchant's Garden greenhouse. The thing is, Chaz and his small crew are beginning to see the bigger picture. 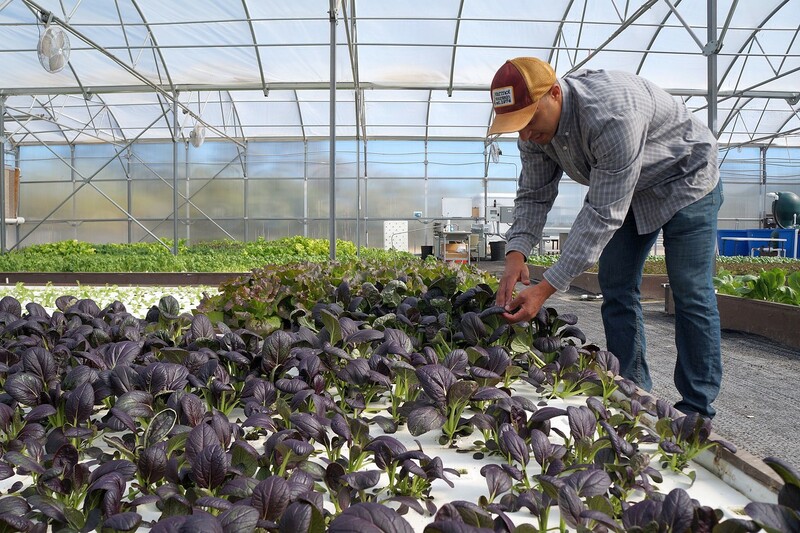 Sure, they started with lettuce and have moved into the fish biz, but with all of that unused property, about 30,000 square feet, they want to turn Merchant's Garden into a hub of education, activity and above all really good food. "We are slowly in the process of removing the unused portables and expanding not just the greenhouse but what we do here in general," Shelton says. "Eventually, this whole area will become a food and retail mecca for sustainable living. Right now, we are working with the landscape architect professor of the UA and his students to re-purpose the grounds for our vision. We want to open a beer garden, have wine tastings, evenings with chefs doing demonstrations and events and classes on food growing. Basically when you Google 'Tucson UNESCO,' we want to be the first link to pop up." Collaborating with Biosphere2 is helping that dream become reality. Thanks to Merchant's Garden and people like Chaz Shelton, Tucson is growing above and beyond the honor of being the first US recognized city of gastronomy and thanks to fish poop, it is a tasty treat all the way to the top.